May | 2008 | FreshTech. Amazon’s Chief Executive Officer Jeff Bezos appeared at the BookExpo America convention in Los Angeles on Friday and talked at length about the benefits of offering electronic books on Kindle. This came after Amazon’s earlier announcement that Simon & Schuster Inc. will make 5,000 books available for Kindle which will result in a the availability of about 125,000 Kindle titles. To-date Kindle e-books account for approximately 6 percent of sales among all titles, but Amazon still will not give details about the number of actual sales. It was only a week ago that Kindle’s price dropped from the initial $399 to $359 a $40 reduction in price which might just be an indicator that Kindle sales may have been on the down-slide…especially in these harsh economic times. Even with this price reduction, Kindle is still about $60 short of its main competitor, the Sony Reader. But then again it does offer the wireless feature which you don’t get with the Reader. On Wednesday Bezos told CNBC that with all the ongoing developments, Kindle is still in its investment phase…meaning that Amazon is still analyzing the future potential of the device. Kindle came out in November and the price at that time was $399. Since then hundreds of Kindle has been sold. But, as expected, when a new product comes on the scene, it starts out at a somewhat “high” price only to be reduced as time goes by. Well, Kindle ‘s time has come and a lot of customers (early adopters) are not happy. Many of them believe that Amazon owe them a refund and have even taken steps to contact the company asking for a refund. But, as expected Amazon said no. Only those who have bought Kindle within the last 30 days of the price cut will get a refund…which if you ask me, I think is reasonable. Consider this. When you decided to buy Kindle, you agreed to pay the asking price at the time. So If the price dropped a few weeks later, you are simply unlucky. If Amazon wants to give you a refund, its at their discretion…they don’t have to because there is no law saying they should. So, the bottom line is live with it and move on. You have one hell of a device in your hand, enjoy it. I, myself am an early adopter, and I don’t f.eel cheated. In fact, I feel blessed to have been a part of the first batch of buyers. I have learned so much about this device since it came on the scene that the $40 dollars does not even matter. Why? Because I know that this in one for the future. In fact, I am expecting further price cuts as time goes by and is looking forward to getting the second version Kindle at a much lower price. That said, If you want to get a glimpse of what others are saying about this price cut, click here . Last week at the SID Display Week 2008 show in Los Angeles, California, E Ink® Corporation, the leading developer and provider of electronic ink technology showed off its new segmented plastic display cells (SDC) which is 40% thinner than its predecessors and operates within a wider temperature range with improved flexibility. Also, a new controller capable of animations, faster menus, typing, tablet screen sizes, and increased gray-scales was revealed along with an innovative electrophoretic color display. What does this mean for the electronic reader market? It means that the leading electronic readers including Kindle , Sony Reader(PRS-505), iRex iLiad, Hanlin eReader V3, Bookeen Cybook among others, which are already using electronic ink technology for content display, could now have a reason to develop the next generation device. As electronic readers move into the mainstream, there is much talk about which one is best. Each device offer excellent features in its own right, some a little more than others, but this may be the time for them to really take advantage of the new technologies and distinguish themselves from the other. Who will move first and in what way? We will just have to wait and see. As for me, I am already imagining having a Kindle (my choice of electronic reader, thus far mainly because of the whispernet technology and the wide array of available content) capable of animations…and if Amazon is listening this may be the opportunity to improve on the navigation buttons, especially the “Next Page” and the “Prev page” ones, which as mention before, are really clumsy. 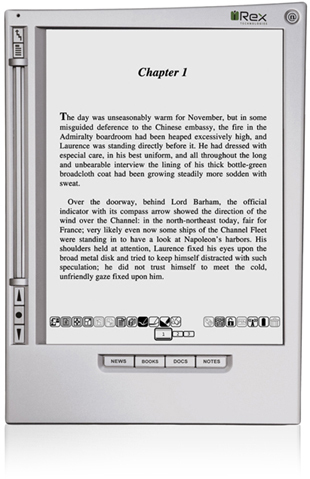 Whatever happens, the future of electronic readers look very bright. Have you written a book and would like to publish it without going through the headache of dealing with a publisher? You can do it with your Kindle. All you need to do is to sign up with Amazon’s Digital Text Platform (DTP), upload and format your book, and sell it at the kindle store …it’s that simple. 1. If you do not have an Amazon account, go to amazon.com and sign up. Once done, sign in and access the Digital Text Platform dashoard. 2. Configure you account information in the “My Account” tab on the Digital Text Platform dashboard to ensure that you get paid. 3. Publish your content by following the steps in this guide. Perhaps its a little premature to talk about the second generation Kindle this early seeing that Kindle came on the scene only seven months ago. With the hundreds of feedback that Amazon get on the device everyday, they simply cannot ignore what the customers are saying. Back in December when everyone was looking toward 2008, I wrote an article about the Kindle Watch. As I look back now and think about the things I said, I think I may have gotten a little ahead of myself. This most recent kindle software: 1.0.4 was released back in February 2008. To get updates, you may not have to do anything. Kindle is designed to automatically check for and download updates when it’s available. If an update is available, Kindle will download and install the update the next time the wireless connection is activated. During the update, you will see screens that show the update progress. The update should take less than 10 minutes and is complete when Kindle displays the Home screen. make sure you do not turn the power off or reset the Kindle until the update is completed. 1. Set the Kindle Power and Wireless switches to the “ON” position. 2. Check the Whispernet status indicator at the bottom of the screen to ensure you are connected. 3. Put Kindle to sleep by holding down the [ALT] key and pressing the [AA] key. If you are unable to update Kindle via the wireless connection, your alternative is to us the computer/USB combination. First you will need to download the update to your computer and transfer the file to your Kindle. This process takes approximately 10 minutes…so be patient. When the update is completed successfully, Kindle will automatically restart and delete the update source file from memory to maximize Kindle’s available storage space. 1. Visit www.amazon.com/update_kindle.bin to download the Kindle software update file. 2. Set your Kindle power switch to the “ON” position. 3. Connect Kindle to your computer using the USB cable. 4. Use your computer’s file browser to copy the file “Update_kindle_1.0.4.bin” from your computer to Kindle’s root directory or the SD card. Do not place the file into one of Kindle’s folders. 5. Check the USB activity indicator on the Kindle cursor bar. When the silver cursor stops flashing, the file transfer is complete and you can safely disconnect Kindle from your computer. 6. Use your computer to unmount or eject your Kindle and disconnect the USB cable from Kindle and your computer. 7. Press the Home key and then select “Settings” from the Home menu. 8. From Settings screen, select “Update Your Kindle”….this menu option will be grayed out if the most recent update has already been installed. 9. Select “Ok” when prompted if you want to perform an update. 10. Check the software version installed on your Kindle by 1) setting your Kindle power switch to the “ON” position. 2) Press the Home key and then select “Settings” from the Home menu. 3) View the version listed at the bottom of the Settings screen. The version listed should be “Kindle 1.0.4 (144750018)”. That’s it thus far…just a simply software update. Maybe there is something else in the works…who knows…whatever happens we will keep you posted. Here’s a video that gives a little more detail about the Hanlin V3. Information about this device is pretty much hard to come by…you can’t even find anything on eBay or Amazon (at least not yet) and that’s saying a lot. If you want to buy the device, you have to order it directly from the overseas distributor…Personally, I am very skeptical about buying form overseas companies in this manner. I have to be able to track my money to an from the distributor so that if anything goes wrong, I can get a refund. Hanlin V3 comes with 1 GB memory card for content storage….Kindle comes with none. If you need a memory card you will have to buy it separately.